According to a new nationally-representative survey conducted by New Frontier Data, nearly nine-in-ten respondents (86%) believe that cannabis has valid medical uses, underscoring that medical cannabis is now a national consensus issue. The strength of this support will make it extremely difficult for any politicians opposed to medical cannabis legalization to find a constituency with whom such a message would resonate. However, there are some concerns associated with cannabis that may be undermining public support for expanded legal access. One-third (34%) believe that cannabis is highly addictive, and 28% consider it a dangerous drug. While these views are not held by the majority, it suggests that there remains a significant opportunity to educate the public on the safe uses of and risks associated with cannabis, leveraging the research done to date which show that cannabis is safer than alcohol, tobacco, and most illicit drugs. 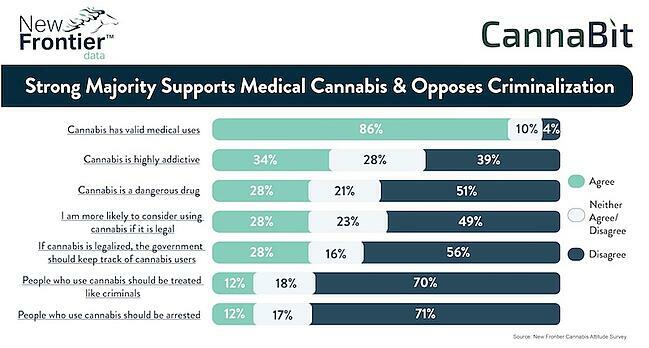 Despite the perception among some about the dangers of cannabis, the overwhelming majority do not support the criminalization of cannabis users. Only 12% of respondents felt that cannabis users should be arrested or treated like criminals, indicating that even among those who may have concerns about the health risks of cannabis, they do not believe that criminal penalties are the most effective way to protect the public health and deter use.